The PRE60 is a supremely sophisticated system control center that effortlessly brings the ever-expanding world of music to your system in all its richness and variety. Due to Primare’s careful attention to detail, whether the source is analogue or digital, the sound of the PRE60 is unfailingly accurate and convincing: truer to the recording – truer to life. The goal was simple for the 60 Series – to build the company’s most thoroughly modern and revealing products yet, all while retaining Primare’s inherently musical sound. The 60 Series is a resounding statement and the next step in Primare’s evolution in creating products for which every aspect of design and implementation has been carefully considered and tested. Entirely designed and hand built in Sweden, the PRE60 preamplifier and A60 amplifier are the culmination of all that Primare has learned in over three decades of producing components of exemplary quality and performance. The PRE60’s integrated DAC/media board offers virtually every possible option for digital playback of the highest resolution, be it streamed or stored media; even allowing for instantaneous connection of handheld devices. In designing this third-generation media board, Primare has carefully tailored the filtering to reveal every bit of musical information from every digital source. For easy system setup and operation, the OLED display on the PRE60 provides critical system information in a crisp and clear adaptive presentation when using the system remote. The Primare App takes your control of the PRE60 to the next level, allowing you to operate the system from your favorite handheld device – including playing streaming services, stored digital media, and thousands of Internet radio stations. Bluetooth® wireless technology further adds to the ease of exploring, sharing, and enjoying music by allowing for instant connection and playback from enabled mobile devices. In a recent issue of Germany’s hi fi & records magazine, reviewer Olaf Sturm is bewitched by the new 60 series pre/power system. 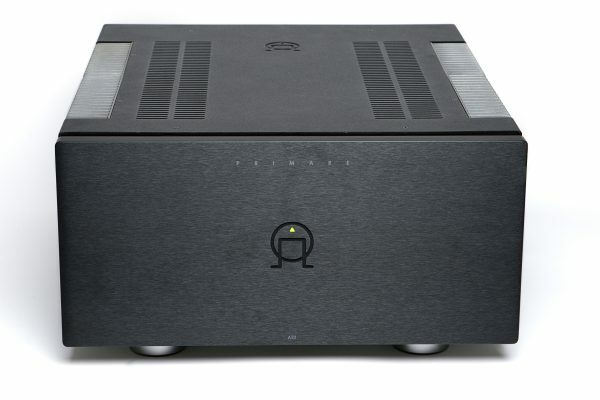 He calls the PRE60 design “pure joy” and is astonished by the measured power generated from the A60’s slim dimensions: “How do you imagine a power amplifier that pumps 675 watts into four ohms and 314 into eight ohms? Perhaps as a walk-in type, maybe with huge, sprawling heatsinks, but by all means totally heavyweight. The A60 weighs in at only 12.5 kilograms…” Above all he loves the sound: “At first it’s the immediacy of the reproduction that wins me over, because it refuses to show even the tiniest time offsets, which leads to perfect homogeneity… The vocal reproduction is characteristic and on par with that of top amplifiers. However a striking feature is the enormous stability in sustained piano chords and the reverb on Gabriel’s voice, which I have rarely even heard in such a 3D sculptured manner.” In conclusion he says that “The enormous range of applications based on the analogue and digital interfaces, which allow anything from elevator music in the morning through internet radio to serious listening of high resolution data files in truly amazing quality, is highly attractive." PRE60 / A60: 60 Series Does It Again! The 60 series has received a great review in Polish hi fi magazine ‘Audio’. Writing in the October 14 issue Wojciech Pacula says “The Primare A60 sounds like a class A amplifier, clearly highlighting the transition from bass to midrange. It isn’t exactly ‘warm’ but neither is it clinical, and it does have the ability to strike forcefully. The strong and perfectly produced bass line provides not only foundation and energy but also richness, which is often missing even in the mightiest power amplifiers....The other end of sound spectrum is equally interesting. Here Primare seems to combine richness with clarity. Through the snare drum hits, bass string reverb and electronic background we get a perfect image of each sound and its texture. The soundstage gains ultimate authority with, I repeat, no harshness whatsoever. This is a marvellous achievement from both class D amplifier and network player”. is a complete digital music media source, providing CD disc, stored and streamed music file playback, along with wired and wireless connectivity and control capabilities.